I have mentioned before that I have oily skin and I use to break out at least once a month and I say I would have 3 breakouts at one point. I religiously wash my face, exfoliate at least twice a week, moisturize my skin and apply a post acne treatment but I would still have the same problem. I wanted to buy the Clarisonic Mia but I was hesitant to shell out $150. So instead about 3 months ago, I opted for this product, it cost $34.99 cdn, which is in my price range, but I was thinking will it do the job that it says on the box. Well, it definitely does, After adding this product to my skin care routine, my skin never felt so clean and smooth and the best part is, I have zero breakouts since I've used this. I use it twice a day, morning and night. You can feel that it deeply cleanses your skin. 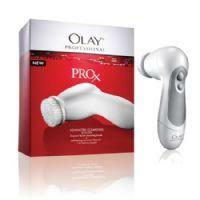 I did not switch to a different cleanser, I've been using Olay Pore Minimizer Cleanser and Scrub with it. I'm completely satisfied with this product. However, I strongly suggest that when using this product, do not press the brush too hard on the same area as it will aggravate it. Overall, I would re-purchase this if it does ever breakdown on me.